As our world is facing a global wave of digitization, almost in every sector and at every scale, the information flow is growing at warp speed. Companies are flooded with big data, and yet eager for quality information. This is what makes data agility a nowadays necessity in the business sphere. But what makes this concept really important? Data application development processes are longing for an incremental and iterative approach that sets the company apart from its competitors. Well, implementing a new mindset is definitely the key to handle the influx of data in the midst of the digital revolution. Today, established companies are breaking up with their traditional methods in order to keep up with the requirements volatility. In this context, companies need to stand out by setting innovative projects. Innovation is strongly attached to agility as it allows companies to reduce development cycles and carry iterative tests with a certain margin of error. Data application development and internet-based services are at the heart of the digital activities and data agility. Being Agile, in this context, is about opening up to the new methods that allow a reactive response to change. The data agility mindset is ripe with the transformative possibilities of managing the workflow and achieving the expected results. The traditional data application development techniques are no longer practical in a rapidly changing, uncertain and complex marketplace. In fact, data agility is more than just a fad phenomenon, the transition to projects agility will be inevitable, in the years to come. It is the nature of the project itself that shape the need to agility. From this perspective, we bring the example of the robotics industry. The evolution of this industry is sometimes hindered by the lack of agility compared to the complexity of the robotic systems and manufacturing. 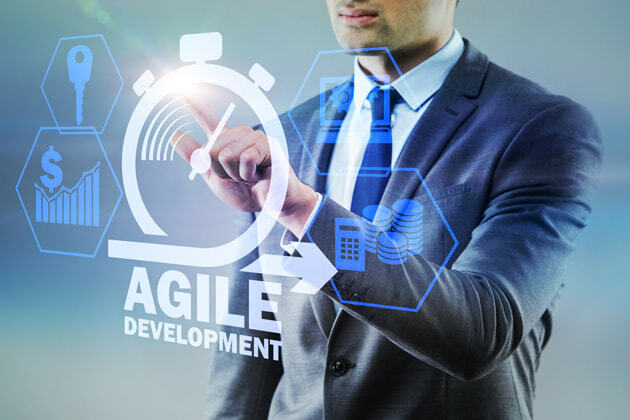 In applying agility-based framework, manufacturers can gain more time and value by optimizing and enhancing the testing and the development of their systems. Why should a company adopt a Data Agility approach? Data agility contributes in enabling the delivery team to reach their objectives in time. In the process of delivering a data application as a whole, a lot can happen (New methods, new requirements, new technologies…). Agile is a way to move fast and rise up to the technological challenges. An agility-based approach will help the company avoid such challenges by scaling the project’s deliverables. For development projects, gaining time is usually attached to cost-efficiency. The agility approach is an experimental and iterative approach, that allows the concretization of exploratory projects. The delivery team can test the project and keep it updated so it can minimize failure risks. Short testing is also a way of backing the workflow through fast-paced actions. Everything is strongly attached to flexibility and adaptability these days. Data agility provides the needed techniques to work around unexpected constraints such as the infrastructural obstacles. Sometimes, the will to apply agility in data projects is faced with issues related to infrastructure or technical integration. Optimize the cycle of developing projects, is an important step to cater to the client’s needs and requirements. Operating at scale ensures a steady flow of additional values. It is more about introducing new dynamic and interactive strategies, instead of a holistic approach. Data agility is mainly about the ability of the company to renew itself and reinvent its offer. The implementation of an agility-based approach is not enough. The company’s willingness to remain nimble regardless of the marketplace instability is also necessary to face technical complexities. Implement a reactive infrastructure : is about the company’s ability to deploy a solution with real data. The idea is to allow the company to iteratively and gradually introduce new features to develop its projects. Furthermore a reactive infrastructure is the ideal way to scale the projects without questioning the used technology and infrastructure. A scalable environment: provide a scalable infrastructure is quite necessary these days. The challenges that the competitive and fast-moving environment can be solved in scaling the project to ensure reactivity and to facilitate data processing and analysis. Companies are motivated by the desire of keeping up and leading the way, which makes agility a key element to succeed. Constant updates instead of diverse and specialized ressources: the agile approach revolves around constant updates to move forward and bring added-value. The company needs to work on gradually enhancing its cycles of development to put innovation at the centre stage. So, instead of only relying on specialized and diverse resources, companies need to work on building iterative and progressive approach. In today’s business world, embracing the change has become inevitable. That’s why, agility is paving the way for creative approaches that help companies to keep up with this new era of digital awakening and information revolution. Agility is an optimized approach to manage the company’s projects. The company grantees the minimization of costs along with effective time management. Implementing data agility provide an optimized application to meet the clients’ expectations. But agility does not come without challenges. These challenges are mainly related to the different structural restraints.